Since 1998 ThingumaJig has become one of the most popular and busiest Ceilidh Bands in the South East with foot tapping music, dances and songs from Scotland, England, Ireland and America, played on a fascinating variety of instruments. The multi instrumental musicians include Ollie Boorman on drums, Pete McClelland with his variety of different instruments, and children's entertainer and workshop leader Mannie McClelland. Pete and Mannie have been involved in the folk music world for over 30 years as founders of Hobgoblin Music : Liz and John Scholey, both experienced callers, dancers and teachers of dance and fitness : together with Tom Phelan on Keyboard and John Rain on Bass. 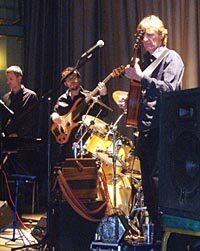 In 2003 the band were featured on BBC Radio 4's "The Wedding Band" rated pick of the day in the Radio Times, showcased in Nashville, and played in a scout hut. Mannie McClelland - Anglo Concertina, Bodhran, Guitar, Mandolin, Vocals. A founder of Hobgoblin Music, Mannie worked full time in the music business for many years. She leads workshops for young children at festivals, is a retired educational psychologist, and is a natural at dealing with any children in the audience. She has been playing traditional music together with her husband Pete for over 30 years. She is also a member of Blackthorn Band, where she calls the dances too. David Sheldon - Piano, Guitar, Cornet, Vocals. David is a regular musician for his local church in Horsham, and recently performed in Westminster Central Hall with the London Emmanual Choir. Dan Dotor - Bass Guitar. Dan studied Jazz at Chichester and moved to Brighton where he immersed himself in the music scene - he has played all Brighton's music venues with a variety of different artists. Dan has also worked and toured the UK extensively with world music ceilidh band Boka Halat. Highlights of his career to date include performing at Sidmouth, Towersey and the Queen Elizabeth Hall. Ollie Boorman - Drums, Djembe, Cajon. He has just completed a UK tour with Don Partridge and Herbie Flowers. Ollie was also a finalist in the BBC Radio 2 Young Folk Awards 1999 with All Jigged Out, and has recently appeared with Candela, a nine piece flamenco group. As a versatile and thoroughly professional drummer, Ollie is regularly in demand for recording session work, touring shows and theatre seasons. John Scholey - Dance Caller, Dancer, Melodeon, Percussion. John is a very experienced caller, and is a morris dancer and musician with Rampant Rooster in Brockham. In his other life John is a health and safety expert, and is ThingumaJig's resident safety officer! Liz Scholey - Dance Caller, Line dance Instructor, Dancer, Percussion. Liz is a highly qualified dance teacher, with qualifications in fitness as well. She has given dance workshops at many events including Sidmouth Folk Festival.